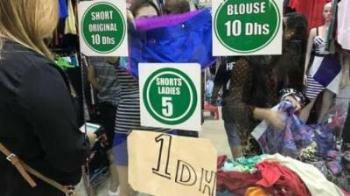 Dubai: Dh1 shirts or shorts, anyone? How about a pair of branded trousers for less than Dh15? Welcome to the world of ukay-ukay (pronounced as "ookai ookai"). The popular Filipino adaptation of the flea market has made its way to Dubai where shops have suddenly mushroomed in the last two years. Shoppers say these thrift shops are cheaper than outlet stores. That is, if you know where to look. The word ukay-ukay is derived from the Filipino term "halukay", which means "to dig" and that is exactly what you need to do in order to find a good bargain. These days, ukay-ukay shops are opening by the dozen all over Dubai. You can't miss them in Al Satwa, Karama, Deira and Bur Dubai. There are even a few in International City. Maricel Munda, an executive at a cleaning company in Dubai, tells Gulf News #Pinoy she goes on a bargain hunt every week, "sometimes every day, just to check if there's a good Dh1 sale". "It helps me save so I don't spend too much of my salary on clothes," she says. There's a mix of bargains to be found: from second-hand fashion items to new factory overruns. Shirts, jeans, trousers, shoes, bags, dresses all for a few dirhams. There are also bargain gems: unused clothes straight from mall outlets. They cost anywhere between Dh1 to Dh10, and usually not more than Dh15. "But you need to have a long patience" to get the best bargain finds for a few dirhams, Munda says. The Filipina says she gets helpful WhatsApp alerts from the sales person when new stock has arrived in the shop so she can get the first pick. The brands in her bargain finds? "Victoria's Secret, La Senza, Aeropostale and American Eagle. Sometimes Levis," she says with a wide grin. No wonder people don't mind the literal bargain hunt. At one shop, #Pinoy found a Michael Kors polo shirt for Dh15. There was also a pair of beige Banana Republic trousers for Dh10. Of course we couldn't vouch for their authenticity, but the dirt cheap price is definitely the real deal. "There's more of this in there," store attendant Irene Maghinay tells us, pointing at a pile of shirts on the floor. "All Dh10," she says. We take a closer look and shockingly find familiar brands. Maghinay says going on a bargain hunt helps her relax. Nothing can beat the thrill of a bargain find, she says. Her biggest thrill was finding a gold ring in the pocket of a pair of jeans she bought for Dh10. "It's real gold and I still have it," she says of her treasure find. Cherry Yanto, a sales supervisor, says ukay-ukay is not just a form of recreation for some Filipinos but it also makes for a good business investment for others. So good that she's planning of opening her own shop when she gets enough money for capital. Yanto reveals that on a week day, the store where she works makes a minimum sale of Dh1,500. "It gets busier on Friday. We make up to Dh10,000," she says. "Filipinos, of course. And there are also Russians, some Europeans and locals," she says. The ukay-ukay habit is definitely catching on with non-Filipino shoppers. Indian national, Sarbjeet Singh, says the affordable prices are a hit with Dubai's budget-conscious shoppers. Why buy a new item for more than Dh100 when you can get it cheap, he reasons. Singh says he buys some of his clothes in ukay-ukay stores. "They're all branded clothes but very cheap. One piece is just Dh10," he says. The brands he hunts for? "Nike, Adidas, Puma," he says. But what about hygiene, we ask? "Just wash it, then it's all good to use," he says.